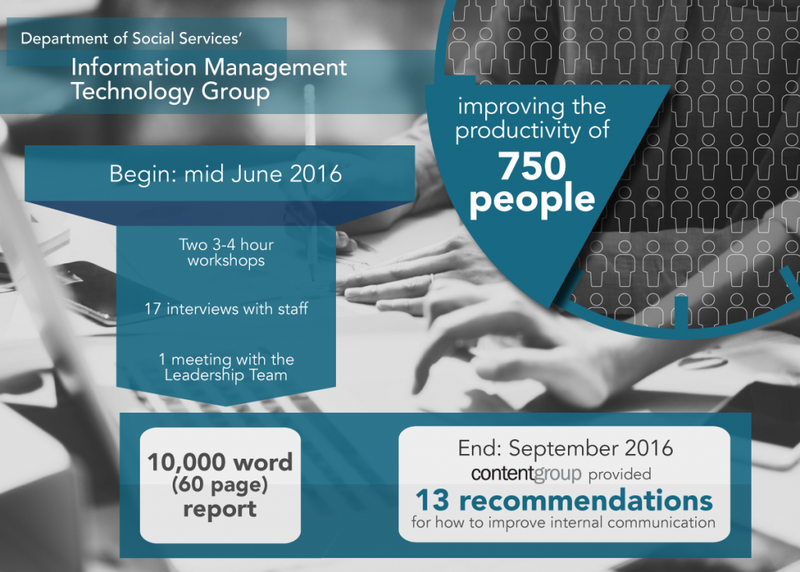 The Information Management and Technology Group (IMTG) of the Department of Social Services had improved their internal communications over the previous 24 months. However, IMTG’s internal communications still needed refining as over the coming years they were going to encounter large-scale transformational change with the coming release of a whole-of-government grants programme. IMTG wanted to improve productivity of their 750-person team to prepare for this change. contentgroup was engaged to develop an internal communications strategy based on industry best practices. We started by creating an extensive stakeholder consultation program to establish the current state of play within the Group. We ran two workshops, interviewed over a dozen staff and directors, and discussed internal communication with the Senior Executive Service. We designed IMTG’s strategy to create a more consistent approach to internal communication. We proposed a hub-and-spoke model of communication and achieved this by formalising the contributions many staff were already making towards internal communication. This tactic was attractive because it involved few additional resources and an organisational model that provides a strong foundation for internal communication. As part of the strategy we recommended that IMTG optimise the structure of all communication activities – meetings, newsletter, reports, and intranet – to flow as one complimentary process. Optimising communication activity also included a focus on the IMTG intranet and developing it to become the source of trusted information for IMTG personnel. This intranet would act as the central news hub of old and new information, such as strategic plans, templates, training materials, and social events. A communication and leadership coaching programme led by the internal communication team was also recommended, along with one full-time employee be allocated to the task of improving the skillset of line managers. This is to ensure the building of internal capacity and sustainably improving internal communications over the coming years. Following from a comprehensive stakeholder consultation period, contentgroup developed a detailed internal communication strategy that included thirteen recommendations to assist IMTG to strengthen their internal communications. The strategy will be implemented over the coming months following final approval by the IMTG Executive.